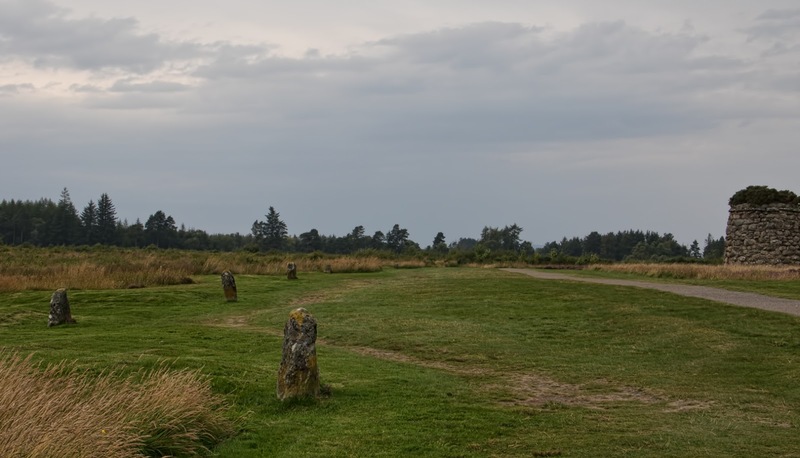 They say the Highlands are haunted, and if ghosts are anywhere, they'd be here, at Culloden. In April, on the anniversary of the battle, you can allegedly hear the fighting, and there's a ghost of a man in Highland dress that many people have reported seeing. I didn't encounter anything that cinematic, but I did have a very strange experience while I was walking around the battlefield. Someone was following me, but there wasn't anyone there. As you can tell from the pictures, it's mostly moor, crisscrossed by paths, and while there were other visitors braving the rain, I was alone most of the time. Except that I didn't feel alone -- I'd be standing in the path taking a picture and hurrying because there was someone behind me waiting to pass, but when I turned around there wasn't anyone there. This happened several times, but I didn't really think about it. Then I saw something out of the corner of my eye, something flapping, like a coat caught in the wind. I stopped, turned around, and of course there was nothing and nobody there. I told myself it was just my shadow, that the sun was probably starting to peek through, though it was still drizzling. And when it happened again, I firmly repeated, It's just my shadow. Again, It's just my shadow. Finally, I stopped and looked for the sun, which was dimly visible, and found my shadow, which was there but very faint. The only problem was that it was on my left, while whatever I had been seeing was on my right. And whatever it was, it followed me all the way back to the visitor's centre. I wasn't afraid, which was maybe the least likely part of the whole episode. I was spooked, absolutely, and had a serious case of the creepy-crawlies, but I didn't feel menaced in any way. Whatever, whoever, it was didn't mean me any harm, and I figured if it was a ghost, it had far more business stomping around moors in the rain than I did. Later, back in the cafe in the visitor's centre, I had a blissfully hot cup of tea, and tried to convince myself that it was one of those optical illusions, where the brain helpfully converts random information supplied by the eyes into something familiar -- a face, a figure, a coat blowing in the wind. But I'd thought there was someone behind me long before I saw anything, and that's something I can't quite explain away.